Khimsar Fort was constructed by Rao Karamsiji, the 8th son of Rao Jodhaji, the founder of Jodhpur in the 16 th century. This yellow-coloured fort is the most popular tourist attraction of Khimsar, located at the edge of the Thar Desert and is an example of Rajputana style of architecture. Originally, the fort was constructed for the purpose of wars, and later on, in the 18th century the royal family shifted into it. Zanana, a special wing exclusively for the royal women was added later. The lawn of the fort is spread over 11 acres, and it further enhances the beauty of the surroundings. Half part of the fort is still occupied by the ancestors of the royal family while the other half has been converted into a heritage hotel. The fort offers 68 luxuriously rooms of which some has the traditional architecture & furnishings, while others have Art Deco, yet equipped with all modern facilities for your comfort. All rooms have Air-conditioning, Heating, LCD television with 200 channels, Mini bar, Tea/coffee making facility, Electronic safe, Telephone with international dialing facilities, Wi-fi internet. Some rooms have private terraces and balconies. By Road: Khimsar Fort is located at the outskirts of Khimsar city. One can easily reach here by bus or taxi from Falna. By Rail: Khimsar Fort is well connected through nearest Nagaur Railway station (40) to major cities railway stations like Delhi, Agra, Mumbai, Chennai, Bikaner, Pali, Jaipur, Ahmedabad. 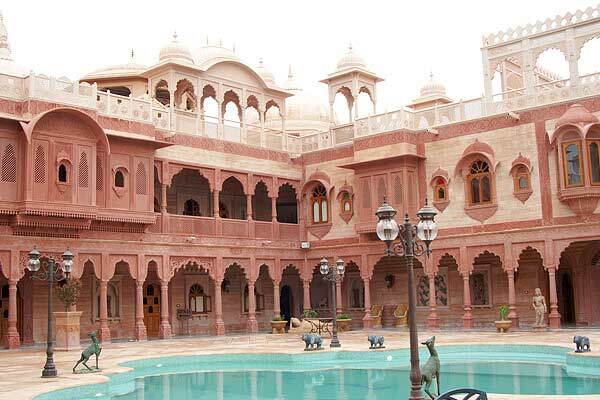 By Air: Khimsar Fort can be reach through nearest Jodhpur Airport (90 km) which is well connected with regular domestic flights to Delhi, Mumbai. Disclaimer : RajasthanDirect.com is not the official website of Rajasthan Government. However we do not own any responsibility for the correctness or authenticity of the information provided here. Please check respective Rajasthan local authorities, Govt and hotel website for latest and correct information. All efforts have been made only to provide the information about Rajasthan. Some of the pictures and copyright items belong to their respective owners. If any copyright is violated, kindly inform and we will promptly remove them.